Fly shop message boards and online angling communities across the Old Dominion are abuzz with the news that three fly anglers are being sued for fishing in Virginia’s Jackson River. The case is unique in that the section of the river in question is considered public by the Virginia Department of Game and Inland Fisheries (VDGIF). North/South Development, which claims that the anglers repeatedly trespassed on private property, filed the suit. North/South Development owns or leases land on both sides of the river and claims to have a Crown Grant dating to the mid-1700s that supersedes state law. 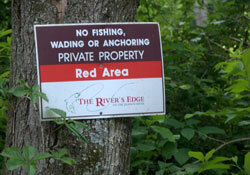 Nearly two dozen signs like these are posted along the Jackson River by North/South Development. Nearly two dozen color-coded no trespassing signs have been posted on both sides of the river by the developer to warn those floating downstream. The signs are clearly visible from the river and advise anglers that they may neither wade nor fish while on that section of the river. This admonishment directly contradicts maps provided by VDGIF both on their website and at the public access launch sites along the Jackson River. The landowners do not object to anglers or paddlers floating through but do not want anglers fishing or otherwise touching the bottom of that section of the river. Usage disputes are nothing new on the Jackson River. In its 1996 Kraft v Burr decision, the Virginia Supreme Court determined that owners of several land grants originally issued by the King of England could indeed prevent others from fishing and wading in the section of the Jackson River from just below the Gathright Dam to Johnson Springs. This section is highlighted on VDGIF-provided river maps; the section of river currently posted by North/South Development, however, which lies between Smith Bridge and Indian Draft, was not a part of the Kraft v Burr dispute and is therefore not recognized by the state as private. Fly anglers have tended to rally round the anglers being sued in the case and condemn the state’s relative inaction. The issue is murkier than it appears, however: The landowners bringing the suit point out that their property lines extend into the river—and they do indeed pay property taxes on the river bottom. Nevertheless, neither the VDGIF nor the Alleghany County authorities are willing to issue criminal trespassing charges to anglers fishing outside of the Kraft V Burr designated area. As a result, the landowners argue that because the state has refused to prosecute trespassers on what they consider, by right of deed, their private property, they have had to take matters into their own hands. Law enforcement authorities may refuse to prosecute anglers fishing outside the boundaries of the Kraft v Burr decision; this does not prevent private landowners from pursuing a civil case. The question for Commonwealth anglers is whether this case will have broader application to other sections of the Jackson River or even other colonial waterways. The Virginia Attorney General’s Office is aware of the case but currently has no plans to defend the anglers in court. Concerned anglers have set up a defense fund for the anglers. For more information, visit www.virginiariversdefensefund.org.